A couple of days back the Parlando Project passed its first birthday. It’s eating solid foods now, and is making efforts to walk. I thought it might be a good time for some posts to catch up a few things. First off, some of you may be new to the Parlando Project and its presence here on this blog. What is the Parlando Project? We combine music (various kinds) with words (various kinds, but mostly poetry). I’m the Frank Hudson in this blog’s domain, and I’m the “editor” of this Project, but Dave Moore (whose voice you’ll be hearing again soon) is the alternative reader and vocalist here, and the project wouldn’t be the same without him. I ask you to note the “various” used twice above. I’m one of those rare people, who when asked what their favorite type of music is, cannot answer. Yes, I have moods when I don’t want to hear one kind of musical expression, or when I strongly desire to hear or make another kind, but overall, I can’t say there is one type of music I want to be gone from forever, or another that I will never listen to or try to make. So please do not take any single example of our music as representative of what you’ll hear next. I like noisy and chaotic music and sweet consonant sounds, I like solo acoustic guitar, I like modern day composers who refuse to die, I like artificial sounds created electronically, I like the natural sounds of strings vibrating in air, I like things simple and I like things complex. The same somewhat applies to the words we use. I have a certain framework that we use at the Parlando Project. We favor shorter pieces for example. We both like a darkly comic touch. We generally don’t use our own words, even though Dave and I have written our own words since our youth, and we’ll use some of them here. Rather than add another “I” speaking to the mesh of the Internet, I want to jointly experience with you some understanding of what others have written and spoken. Why is that? The Internet is full of self-expression. I don’t want to put that down, but I feel the various mediums the Internet carries to your phone, tablet or computer are awash in it. Even our literature has become primarily memoir in one guise or another. Well, I consume some of that, you probably do to, but I’m currently not in the mood to create more of it. Rather than add another “I” speaking to the mesh of the Internet, I want to jointly experience with you some understanding of what others have written and spoken. That’s what I seek to do by performing the Parlando Project pieces, and writing about them here. 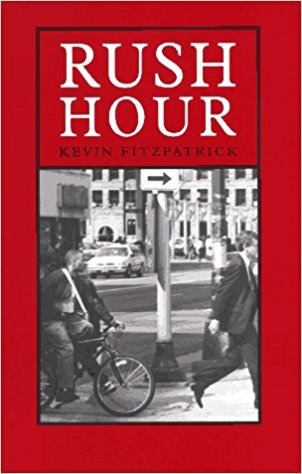 A poet who Dave and I have known for decades, Kevin FitzPatrick, was once reviewed as writing “poems that have other people in them.” Kevin’s other people are real characters, they have their own lives and wholeness, they are not hand puppets speaking only the words he mouths for them. They, like Kevin, are sometimes funny and sometimes subject to their own misconceptions and foibles. You can find a copy here, here or here. Stop and think for a moment now of how few poets do what Kevin does. Perhaps, if you write poetry, you too, fall into that larger grouping, writing from your innermost feelings, allowing other voices to speak only as you would have them. At the Parlando Project I use the idea, the rule, “Other People’s Voices” to remind me of this principle. I join with you, the listener and reader here, in trying to understand those other voices, by merging our performance of their words with the music we create as an audience to them.